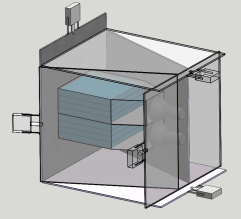 The Cube assembly (Figure 1) consists of two 20-cm thick scintillators of 0.25-m^2 area each, enfolded by 1-cm thick, 1-m^2 area scintillators. This design ensures that no particle may hit the inside 20 cm without hitting the surrounding ‘‘veto’’ scintillators. The 20-cm thick plastic scintillators are overviewed by the photomultiplier PM-49 with a large cathode operating in a low-noise regime. Surrounding detectors (six units) are 1-cm thick molded plastic scintillators. The efﬁciency of neutral component detection by 1-cm thick scintillators is ~2% and weakly depends on the energy of gamma rays. The energy losses of passing electrons and muons in 20-cm-thick plastic scintillator are ~40 MeV. Taking into account the construction material of the detector (2-mm iron tilt and 1-cm plastic scintillator), and the roof of the building (1-mm iron tilt), the electron registration energy threshold for the upper 20-cm-thick scintillator is estimated to be about 8 MeV and the bottom one ~40 MeV for the vertical ﬂux. The obtained efﬁciency of gamma ray registration equals ~20% and weakly depends on energy.